It is fair to say that Nzuri Copper Ltd (ASX:NZC) as an ASX-listed copper-cobalt company has copped a raw deal in 2018 courtesy of commodity price movements in its core metals. Though Nzuri’s shares are up about 10% week on week, and hit a five month high on Tuesday, this could, and arguably should, be the start of a sustained recovery. While the company has made outstanding progress in working towards developing its flagship Kalongwe Copper-Cobalt deposit in the Democratic Republic of the Congo (DRC), key developments such as an updated feasibility study for stage 1 and a preliminary economic analysis for stage 2 failed to attract any interest despite the fact that they demonstrated outstanding project metrics. From a broader perspective, Nzuri is focused on the identification, acquisition, development and operation of high-grade copper and cobalt projects in the Katangan Copperbelt of the DRC. The company has two key projects in the DRC, the Kalongwe copper-cobalt development project and the Fold and Thrust Belt JV exploration project with Ivanhoe Mines Ltd (TSX:IVN). The 85% owned Kalongwe Copper-Cobalt deposit is the near-term focus with the prospect of bringing the first stage operation into production in a relatively short period of time. 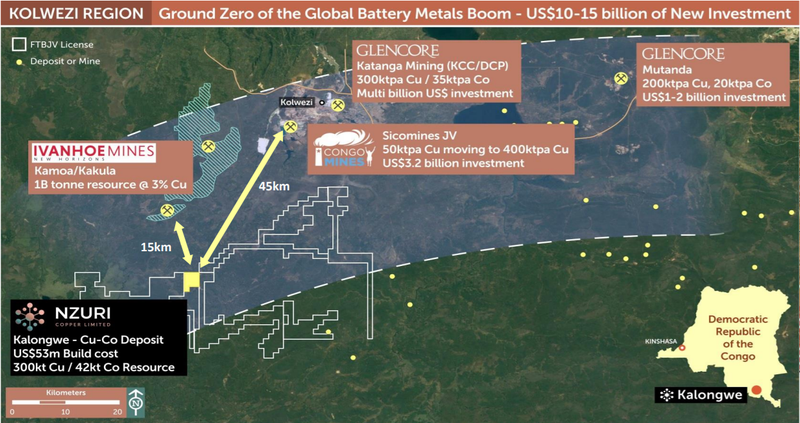 Kalongwe is in the Lualaba Province of the DRC and is situated towards the western end of the world-class Central African Copperbelt, less than 15 kilometres from where Ivanhoe Mines has announced a second world-class copper discovery at Kakula. As you can see below, Nzuri is rubbing shoulders with multinational mining groups that are operating large producing mines in close proximity. 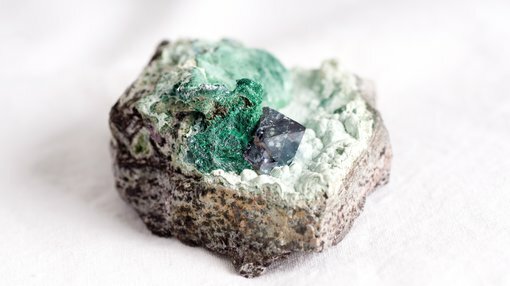 Kalongwe hosts a near-surface JORC resource of 302,000 tonnes contained copper and 42,700 tonnes contained cobalt as predominantly oxide ore. This makes it one of the largest and most advanced copper-cobalt assets being developed by an ASX listed company. Given that it is fully permitted and ready to build and situated in close proximity to infrastructure, smelters and off-takers the project offers investment appeal. Nzuri’s other interest in the region is the Fold and Thrust Belt JV (“FTBJV”) project consisting of five highly prospective tenements. The FTBJV project is managed by Nzuri, covering an area of the western Lufilian Arc, a fold belt that contains the world largest cobalt endowment and some of the richest copper deposits in the world. 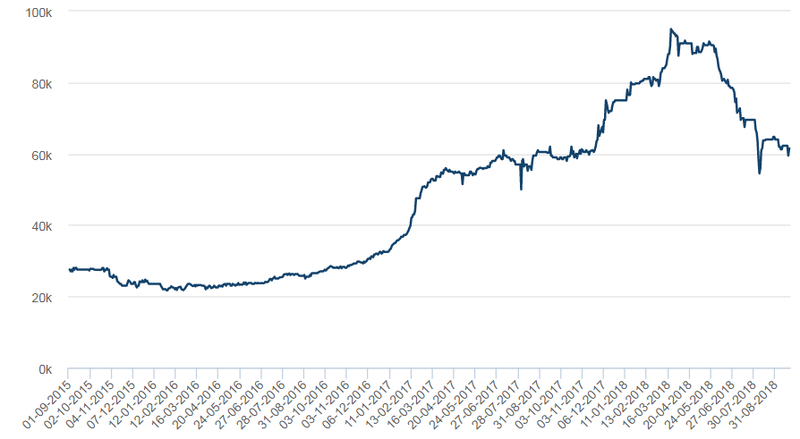 So, with the company having a stellar year in terms of news flow, why does its share price look like this? In particular, the company’s shares should have surged in April and maintained an upward trajectory on the back of its updated stage one feasibility study which indicated significantly enhanced financial returns. Furthermore, it recently indicated that construction of a 1 million tonnes per annum processing plant with a mine life of eight years could be completed within 12 months. By the end of June, the company had completed most of the preliminary construction works, and management recently said that there was a 12 month timeline to production, reaffirming its position as the most advanced copper-cobalt project being developed by an ASX listed company. The reason for the discounted share price is very simple — the commodity prices of both cobalt and copper have come off significantly in 2018. This is indicated below, but the first chart also shows that the cobalt price appears to be consolidating in the vicinity of US$60,000 per tonne, which is about the midpoint between the base of just above US$20,000 per tonne that was formed in 2015/2016 and the heady levels of circa US$95,000 per tonne that were claimed in March. Similarly, copper price volatility commenced in the first quarter before the commodity plunged sharply between June and August. However, there has been a significant recovery in September with the red metal increasing from circa US$5800 per tonne to more than US$6300 per tonne. While commodity price weakness explains the downturn in Nzuri’s share price, and recent stability in cobalt along with a rally in the copper price has contributed to the company’s share price recovery, it could be argued that there is more upside to come. 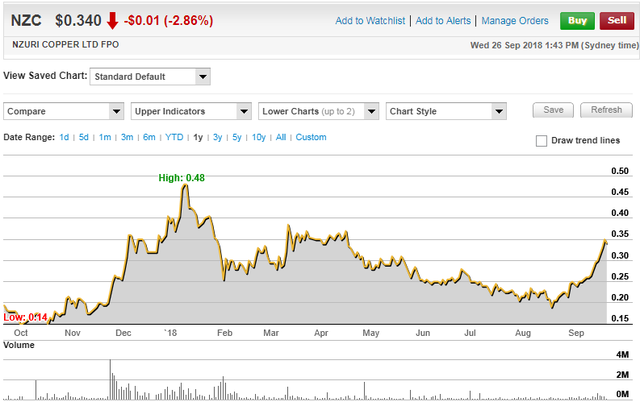 There is no disputing that Nzuri is recovering from an oversold position, and that the promising developments that occurred in the last six months weren’t reflected in the share price, which raises the question as to whether the recent recovery sufficiently factors in the developments that have been overlooked. There are a few strategies one can use to attribute a value to Nzuri. One is to strip out all of the factors that have been significant during its slide from 48 cents per share at start of the year to its current level. This includes not just commodity price movements, but the key value driving information that was provided in the stage one feasibility study. This is how Canaccord Genuity analyst Larry Hill summed up the company in February. “Based on DFS outcomes we determine a base case valuation (stage 1, NPV15%) for the Kalongwe project of $117 million, equal to 50 cents per share. “We have also detailed a number of assumptions used to calculate an indicative valuation (NPV15%) for stage 2 at Kalongwe for an expansion of a SX/EW + Cobalt Hydroxide plant of $254 million, equal to 95 cents per share on an undiluted basis. Hill stresses his valuation was conservative, and this was fair comment given that his cobalt projections were well below the heady levels that prevailed in the first quarter, ranging from approximately US$30 per pound in 2018 to US$33 per pound in 2020. This is slightly shy of Nzuri’s cobalt assumed feasibility study price of nearly US$37 per pound. However, the copper price of US$3.00 per pound isn’t far off the mark, and the commodity was trading at that level as recently as June/July. 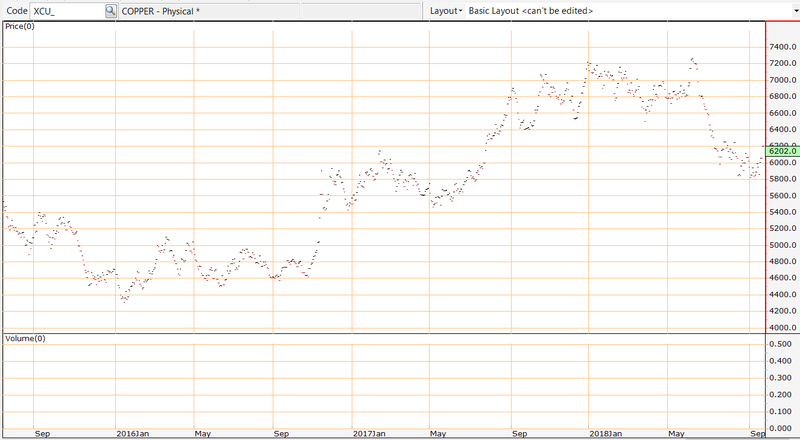 Hill’s valuation is also founded on a copper price of US$3.00 per pound. By comparison, analysts at Bell Potter are forecasting the copper price to range between US$3.25 per pound and US$3.33 per pound between 2019 and 2021 inclusive. Given the stage 1 financial metrics improved considerably based on the revised feasibility study, the slight variances in commodity price assumptions appear to be compensated by the compelling project economics. This includes an internal rate of return of 99%, an eight-year mine life and cash costs of US$0.85 per pound. The extremely low costs are attributed to cobalt credits, and this should also be a feature of stage 2 production which according to the Preliminary Economic Analysis as indicated below should see a total of 28,100 tonnes of cobalt produced over the 14 year mine life — this includes stage 1 production. Leading Chinese group Zhejiang Huayou Cobalt Co. (Huayou Cobalt), through its wholly owned subsidiary, Huayou International Mining (Hong Kong) Limited (Huayou HK), has a 14.76% stake in Nzuri. Huayou Cobalt has established operations and operational experience in the DRC, and it is the largest cobalt chemicals producer in the world, accounting for approximately 25% of global production. Obviously when it crunched the numbers the valuation looked attractive. The group also participated in a capital raising in May.